The fourth of July is a massive deal to our cousins across the pond. And luckily, with a fair few of them living here in London, we can all get a piece of transatlantic action with the best US style dishes in town being served up for Independence Day celebrations. 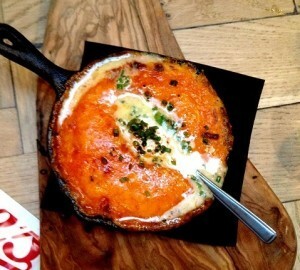 Kentish Town newcomer Joe’s does down and dirty comfort food from the Deep South and they do it darn well. There’s a menu fit to bursting with jailhouse classics like impossibly juicy Shrimp & Grits (lovingly stone ground for hours), incredible proper fried chicken in an inventive sweet tea brine and waffles with their own honey bourbon syrup. The star of the show is the Spoon Bread — a skillet full of gooey corn bread impregnated with clotted cream and more than a little cheese. 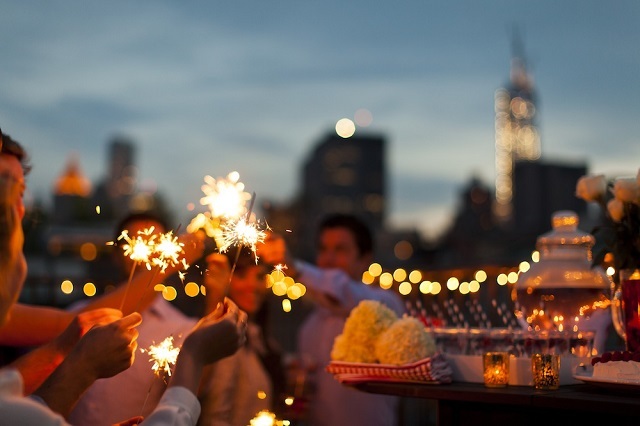 This 4 July there’s live music, BBQ, free sliders and a very well stocked bar. Try the Pickleback (bourbon and pickle juice shooter), we insist. This swanky mini-chain of upmarket steak houses pride themselves on their in-house dry ageing of meticulously sourced US beef. Ask your server to explain the cuts in detail and help you pick from a menu of Porterhouse, T-bone, NY Sirloin and more. Then, it’s expertly cooked over the specially-imported wood-fired grill at temperatures reaching 400C for the perfect charred crust and blushing inner. Sides include a stonkingly good creamed spinach, maple pecan carrots and fat lobster tails. We ordered them all to accompany a giant bone-in rib eye and had to be rolled home. One for the expense account. Soho stalwart Ed’s is one of the original American style diners in London. All the classics are available in a fun 50s environment, so pull up a seat at the bar and tuck into a good honest American hamburger or chilli dog. 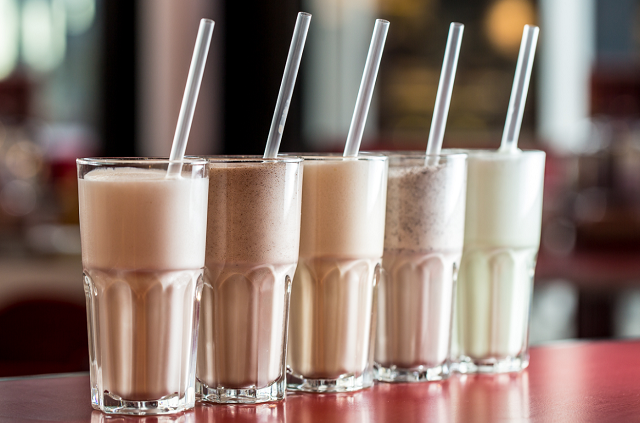 Their shakes are the stuff of legends and rightly so: a double serving of thick, creamy Oreo, peanut butter or butterscotch milkshake is practically a meal in itself and has to be tasted to be believed. 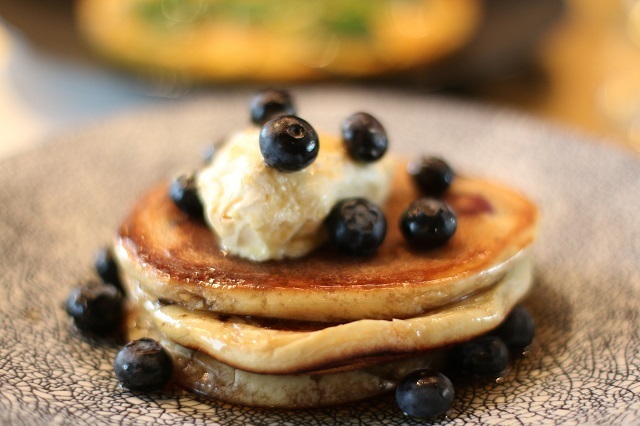 The views from the glamorous Thameside hotel aren’t the only thing taking our breath away; their American style pancakes are quickly amassing a cult following of brunch aficionados flocking to try this classic US sweet treat. Sea Containers serve theirs blueberry flavour with preserved lemon butter and drowning in maple syrup. There's also the option to add bottomless bloody Marys or Prosecco. Londoners have gone ga-ga for this classic US foodstuff, and we’re not going to be the ones to spoil the party. Get your carb fix with Anna Mae’s pimped up menu of amazing mac 'n' cheese street style. Their festival-ready van makes regular stops around town which you can follow via their website. They’ll be parked up on the Southbank this weekend and we order you to try the ‘Kanye Western’ as a matter of urgency — it’s an indulgent portion of big pan-cooked macaroni cheese topped with beef hot dog, Anna’s BBQ sauce and crispy onions. Good grief. Arguably London’s most famous New York style deli, Harry’s, in leafy St John’s Wood is never without a queue. News of their 'Jewish penicillin' chicken soup has spread over the years (since 1948) and signature deli sandwiches like smoked salmon, pastrami or egg and onion on rye, pita or bagels along with proper coleslaw and pickles will never get old. Fashionable brunch dishes like shakshuka and challah French toast feature alongside retro nosh like viennas, meatloaf and schnitzel. But be sure to leave room for the NY cheesecake. Bubbledogs will be offering a special hot dog to celebrate Independence Day - the PB & J. 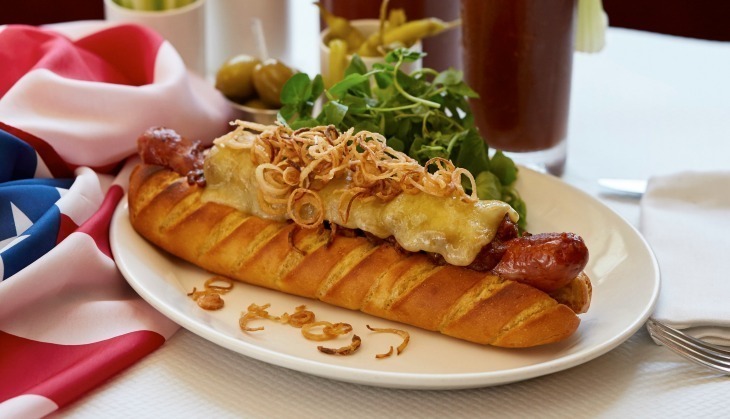 The dog is made with bacon jam, spiced peanuts and, of course, a gourmet hot dog. Sounds like one for the truly homesick to us. The dog will be available throughout July. Could you eat The Dagwood? All Star Lanes will be serving a riff on an all-American sandwich this year - The Dagwood. Traditionally a towering, multi-layered deli sandwich, the bowling alley have re-invented it as a burger. 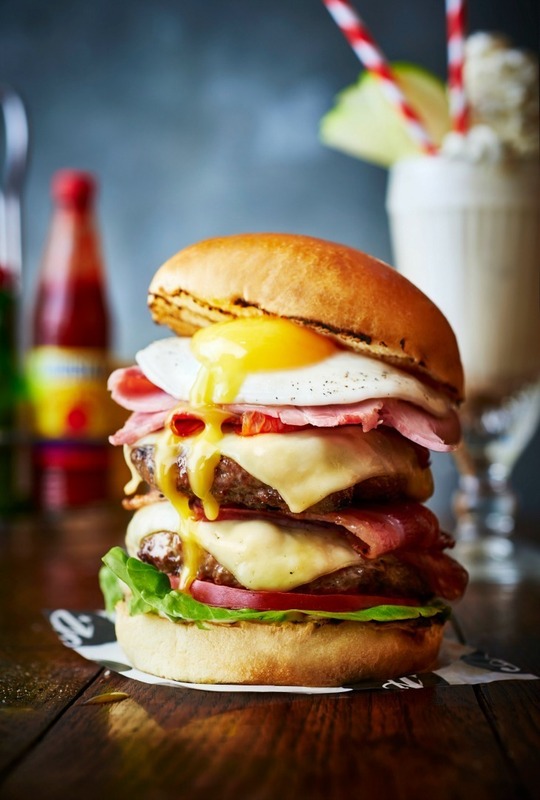 The 6 inch burger consists of 12oz double chuck and rib patties, fresh cuts of cured salami, spicy chorizo, deli sliced turkey and Swiss Cheese topped off with a runny, sunny-side egg in a toasted brioche bun (£17.50). The London outpost of this cult New York brasserie is offering food for free this Independence Day. There's a catch, obviously, which is that you need to dress up in stars and stripes. Shouldn't be too much of a hardship for the properly patriotic? The Independence Day-Dog, signature mac 'n' cheese and Balthazar burger will be available plus other sweet treats, with a 4th July Crush cocktail, Bloody Mary or an ice-cold Bud to help things go down. The patriotic 4th July dog at Balthazar. Get some of London's best BBQ at Brad Macdonald's proper American style BBQ restaurant in Soho. Expect the best cuts of meat, slow cooked and served up with pickles and potato rolls. There's also a giant banana pudding for dessert. By Joanne Gould — follow her on Twitter @joeatslondon or visit her site here for more London eating escapades. For more tips on eating American, try our guide for US ex-pats or this one all about Southern food.